(Bloomberg) -- A tycoon-turned-politician and critic of Thailand’s military government said questions are being asked about the reliability of Sunday’s election, after initial results put the junta leader on course to return to power. 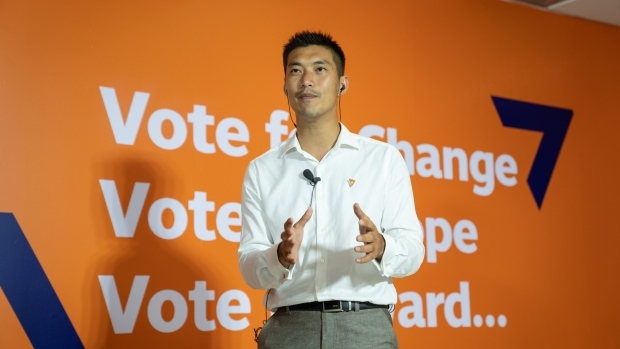 There are reports of many irregularities in the vote, Future Forward party leader Thanathorn Juangroongruangkit said in a Bloomberg TV interview. The current military administration is likely to form the next coalition government but it’s set to be unstable, he said. "People now start questioning the credibility of this election" as well as the agency in charge of conducting it, 40 year-old Thanathorn said on Monday. His upstart party garnered more than 5 million votes, a stunning debut that puts it on course to be the third-largest in the lower house of parliament. The Election Commission was due to announce late Sunday the number of lower-house seats won by each party but in a surprise move delayed the results to Monday afternoon. Instances of reported irregularities included areas where ballots exceeded registered voters, Thanathorn said. Some candidates have already filed complaints asking for recounts in their districts amid criticism of the commission’s performance. The agency couldn’t immediately be reached for comment. Thailand has a troubled history with democracy, including an invalidated election in 2014 before the coup that year. Twitter hashtags such as #Election2019Cheating were trending in the country on Monday. Thanathorn used a savvy social media campaign aimed in part at younger voters, repeatedly attacking the junta and calling for constitutional changes to allow the full return of democracy. Critics say the military-backed charter, Thailand’s 20th, will allow appointed soldiers and bureaucrats in the junta-appointed Senate to stifle politicians elected to the lower house. Thanathorn has earned the ire of the generals and could be indicted on Tuesday after officials accused him of spreading false information online. He’s denied the claims and said the authorities are trying to muzzle critics. A political party created by the military government is leading in the election on more than 7 million votes with almost all ballots counted. The party, Palang Pracharath, aims to install junta chief Prayuth Chan-Ocha as prime minister of a pro-military coalition administration. Pheu Thai party, another opponent of the junta, is close behind in votes and may be part of the an opposition bloc along with Future Forward. That signals friction ahead in the legislature. Thanathorn, whose family controls one of Thailand’s biggest manufacturers, auto-parts company Thai Summit Group, said the next government is likely to be unstable. "There might be another election, there might be another military intervention," he said. "Everything is still on the table." --With assistance from Suttinee Yuvejwattana.